恋爱豆腐果 (Liàn Ài Dòu Fŭ Guŏ) literally means "lovers' tofu." The provenance of the name is not immediately clear when you look at it. Unless you have a very different notion of love than I do. One story behind the name says that it was invented in Guiyang during World War II. Air raid sirens were common; citizens frequently found themselves waiting for the all-clear. These long hours in close quarters were fertile ground for two things: love and hunger. Love has a way of taking care of itself. The hunger was staved off by the creation of this dish. As new romances flourished, the lovers ate this tofu, giving it its distinctive name. Whether or not this story is true, lovers’ tofu remains a popular dish to this day in Guiyang. Other than the name, the distinguishing characteristic of this variation of tofu is that it is stuffed chock full of other ingredients. The tofu itself is somewhat unremarkable: crispy, yellow exterior; very soft, white interior. This relative blandness is probably wise, as the stuffing packs a powerful punch. Each vendor’s recipe for the stuffing is different, but most will include chili powder (typically of the málà variety), ginger, scallions, soy sauce, garlic, and a generous handful of zhé ĕr gēn. (Zhé ĕr gēn is both common and distinctive in Guiyang's cuisine. It is the root of this plant and it has a powerful medicinal taste.) Notice that each of those ingredients has a strong taste on its own. Put them all together in one concentrated mélange and it is very strong indeed. Honestly, it was almost too powerful to eat. Remember that this is not a sauce or a seasoning—it is a pile of these ingredients inside the tofu. Like I said above, you become thankful for the basic non-flavor of the tofu. To be sure, 恋爱豆腐果 is a powerfully flavored street food. And that's good--it's nice to have a strong flavor sometimes. For roughly 3 - 5 RMB it makes a nice snack, the memory of which will stay with your taste buds for a good long while. Eaten alone or shared with a lover, you can't go wrong with lovers' tofu. Sometimes the simplest foods are the best foods. Simple foods don't pretend to be anything they are not. They offer great tastes for limited effort or cost. One super example of a simple food is the You Xuan (油旋) in Jinan. The final product is a slightly salty coiled pancake, crispy and golden on the outside, warm and doughy on the inside. Because the dough was coiled rather than balled, the crisp edges are not limited to the shell, but follow the outline of the spiral right to the center—a perfect ratio. It's such a simple product, but it really hits the spot, especially if you're the type of person who gets cravings for oily, salty snacks such as potato chips. You shouldn't pay more than about 2 or 3 RMB for one pancake. Definitely worth it for this tasty snack. Recently a friend shared this article from the Wall Street Journal with me. This is actually something I wanted to write about anyway, so the article provides a nice cue. Although my situation was a little different than the ones described in the article, the basic facts remain the same: I was running out of days on my multiple-entry 60-day tourist visa, so I needed to leave the country and then come back in to reset the count to zero. (Note that this is only possible with a multiple-entry visa. If you try this with a single-entry visa, you will get stuck in Mongolia.) China shares land borders with 14 different sovereign nations, plus Hong Kong and Macau (which, although part of China, have different visa requirements), so if you need to leave and come back in, you have some choices. Most people go down to Hong Kong or Macau, as that tends to be the easiest border crossing, but I was in the north of the country and didn't want to head all the way back down south. As an American, I didn't need a visa to enter Mongolia (thanks, Mongolia! ), and it was much closer to where I was than Hong Kong, so it was an easy choice. I did a bit of internet research before heading up there and found a number of sites with varying degrees of helpfulness. It may be futile to add another voice to the crowd, but I thought I might be able to offer some additional insight on how to make the border crossing. I figured I could provide some information that I wish I had known before I went. So here goes. Most people who go from China to Mongolia cross the border through Erlian (also called Erlianhaote or Erenhot). Erlian is a tiny border town of no more than 20,000 inhabitants. Even though the city is not very large, the biggest thing that would have helped me in my research would have been a map. I took the liberty of creating one here. This map should show everything you need to find in Erlian. Chances are you will arrive in the city by either bus or train. The stations are only a few blocks from one another, and are shown on the map with a bus icon and a train icon. If you are in the center of town, the most obvious landmark is the huge sculpture in the middle of a roundabout marked with a yellow pinpoint on the map. The road running roughly east-west of the sculpture leads directly to the train station, and the road running more north and south heads straight up to the border crossing. It's probably the easiest way to get your bearings in the city. If you are looking for the border crossing and you can see that sculpture, just go north on that road. If you see signs that say "国门" (literally "country gate"), you're going in the right direction. You should also be able to see a giant rainbow sculpture directly in front of the border (marked with a red pinpoint on the map). Drive from the Chinese border gate to the Chinese customs building (the blue pin on the map). Get out, go through customs, go out the back door of the building, get back in the jeep. At this point you are technically but not geographically out of China. Drive from the Chinese customs building to the Mongolian customs building (green pin on the map). Get out, go through customs (welcome to Mongolia!). If you are staying in Mongolia, exit the building through the back door, get back in the jeep, and drive to Zamyn-Üüd, Mongolia (and skip all future steps). If you are returning immediately to China, make a U-turn to the left just before the exit doors. This will place you right by the departure customs desks for Mongolia. Go through customs, wait outside for your jeep. Get back in the jeep and drive to the Chinese customs building (again). Get out, go through Chinese customs (welcome to China! ), go outside to wait for jeep. Get back in jeep, drive through Chinese border gate, and get out wherever the driver drops you off. That's all there is to it. One thing to keep in mind is that at some of these stops the jeep will need to be searched by customs officials. A lengthy queue of cars is not uncommon. You may have to wait longer than you expect for your jeep to catch up to you. Also, a word of advice from my own experience: if you are doing a round-trip and plan to use the same driver, make it as clear as possible with the driver where you are going to meet him. I thought my guy and I had a good understanding, but I ended up waiting outside in the cold (≈ 0° F / -17° C) for about half an hour before another driver took pity on my shivering form and let me into his jeep. I got pretty lucky there, I think (even luckier in that he didn't charge me anything, so I managed to do the whole there-and-back trip for only 30 RMB), but I wouldn't count on that happening every time. 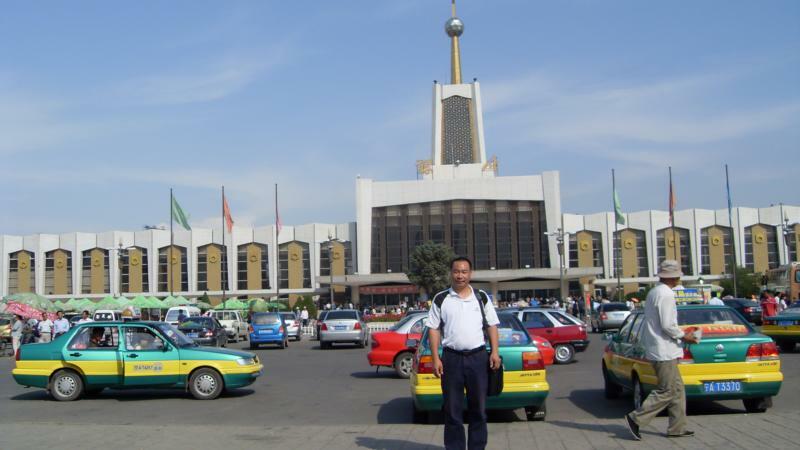 Some drivers may want you to go with them all the way to Zamyn-Üüd before they take you back through China. It all depends on the driver. Just make sure it's clear ahead of time. I hope this map and description helps out some. If you have any questions about how this all works, feel free to leave a comment below and I'll try to answer. All in all, the process is easy enough and takes only about an hour and a half. Tickets in and out of the town aren't plentiful, but they exist. Erlian is a pleasant enough place to spend a night. There are dinosaur statues to see in town and south of town on the main road (some are marked on my map) and I have been told the dinosaur museum is worth a visit. If you are in the north of China and need to refresh your multiple-entry visa, this may be the option that makes the most sense. Good luck out there, folks. Given its location, it's no surprise that seafood dominates the culinary scene in Qingdao. The seafood there is fresh and delicious, just as one would expect from a coastal city. One local highlight is a creature found all over the world's oceans, but not typically considered "food": the humble starfish (海星) (hai xing). These little guys are dried out, leaving the top rigid and sharp, like armor. The bottom is all covered in unappetizing protrusions known as "tube feet." See that olive green mush inside the leg? There's your food. It's not particularly classy, but the thing to do now is hold that leg open and use your tongue to dig out that succulent starfish meat. If you've ever eaten river crabs in China, you'll find that the starfish tastes just like the brain area of the crab. It also tastes very similar to the sea urchins that you can find all over Qingdao. Note that the sea urchin meat is hidden under a layer of egg custard for some reason. If you've never had the pleasure of eating river crab or sea urchin, I guess the closest way I can approximate the taste is that starfish tastes the way a beach smells at low tide. The texture is soft, moist, and mushy. I'm probably not making it sound very appetizing. But that's how it is. It's no coincidence that sea urchin (which, again, tastes very similar) is considered an acquired taste. I'm going to guess that this is not going to be a favorite for everybody. For the seafood lovers out there, though, it's worth a try. It's a bit more expensive than a lot of street food (you will probably pay between 10 and 20 RMB for a single starfish, depending on how touristy of an area you're in). One other note: it's not clear how much the locals eat starfish on a day-to-day basis. Though it is traditionally eaten in the Qingdao area, these days it seems to be mostly for tourists. For travelers looking to have the "local experience," this might be off-putting. Which is too bad, because the starfish is a unique local treat. This might be one of those times where it's okay to jump on the touristy bandwagon and give it a go. "Please come, my friend." So began the response to the first couch request I ever sent through www.couchsurfing.org. Couch surfing, for the uninitiated, is a new term for a very old concept—hospitality. Through the Couch Surfing website, travelers to an unfamiliar city can find locals who are willing to meet up for coffee, show them around the city, or even offer a place to sleep. It is citizen diplomacy in its purest form. When I was planning my trip through China, I decided to give couch surfing a try. I had heard about it before but had never been in the position to host, so I never got around to signing up. On a whim I thought, "well, let's see if they have any couch surfers in China." It didn't take long to find out that China has an active and vibrant couch surfing community. Just to see what would happen, I sent out a request to a couch surfer in Shanghai, the first stop on my journey. Within five hours I had received a reply. The minute I received that reply, I was hooked. In the three months that I crisscrossed China, I spent 53 nights in the homes of 30 people I had never met before. I stayed with Chinese nationals, foreign expats, college students, families with children, retired people, gay, straight, men, and women. I slept on couches, floors, and beds in lavish homes and modest, spartan apartments. Every host was gloriously different and added something new to my Chinese experience. One host was the assistant artistic director at a Cirque du Soleil type show at a big casino in Macau. He was able to get me good seats for the amazing show for a much better price than I could have afforded otherwise, and then I got a backstage tour afterwards. One host's father was generous enough to gift me with an old sweater from his closet when it seemed like I was cold. I wore that sweater every day for about a month (I received it just before the coldest parts of my sojourn). One host drove me to and from a different city two hours away just so we could sample some of that city's street food. Several hosts (or their families) included me in big traditional Chinese dinners and made me feel very welcome. There are many more highlights and lots of great stories; these are merely a sample. Becoming a couch surfer is easy. Registration at the Couch Surfing website is free. Once you've signed up, you can search for other registered surfers anywhere in the world. Likewise, they will be able to find you if they search for your city. New couch surfers often express a concern for safety, which the Couch Surfing website addresses with several safety measures. First, all participants have the opportunity to become a "verified" member. Essentially, a couch surfer can use a credit card to make a small donation to the Couch Surfing organization. This allows the website to verify that a surfer is using his or her real identity on the website. The second key safety measure is a community vouching system. Only couch surfers who have been vouched for three times by other couch surfers have the ability to vouch for the people they have met and trust (the vouching began with the site's founders and the people they trusted, and spread from there). The best safety measure, of course, is that you are never under any obligation to host a person who wants to stay in your home. You can judge from the person's request and profile page (including reviews from other members) whether or not you feel comfortable hosting him or her. For more about couch surfing safely, visit www.couchsurfing.org/safety. Speaking from personal experience, couch surfing is an exciting way to interact with people of different cultures. As a solo traveler, the free accommodation was nice, but the opportunity to learn about a new city from a local was priceless. My book (and this website) are 100 times richer because of the local knowledge shared with me by my hosts and their families. I joined the community on a whim. That was, perhaps, the best whim-based decision I ever made. Note: This article previously appeared, slightly modified, in the July 2012 issue of the NCIV Network News. If you eat enough street food, it becomes clear that a lot of popular local foods in China are very similar to the foods in the next town over. Oh, sure, they say they are very different, but the differences are often small and occasionally indistinguishable to an outsider. Take, for example, Yang Za (羊杂) (miscellaneous sheep organs). Cities all over Northern China include this in the ranks of their traditional local street food, but really it's just variations on a theme. The Yang Za in Yinchuan tastes about the same as the Yang Za in Xi'an as the Yang Za in Lanzhou, the capital city of Western China's Gansu Province. While they all taste good, it's nice when you come across something that really is unique. Lanzhou's Niu Nai Lao Zao (牛奶醪糟) (Milk with Fermented Glutinous Rice) is just such a dish. There it is. As I said, it really looks different than most of the foods you'll see in China. 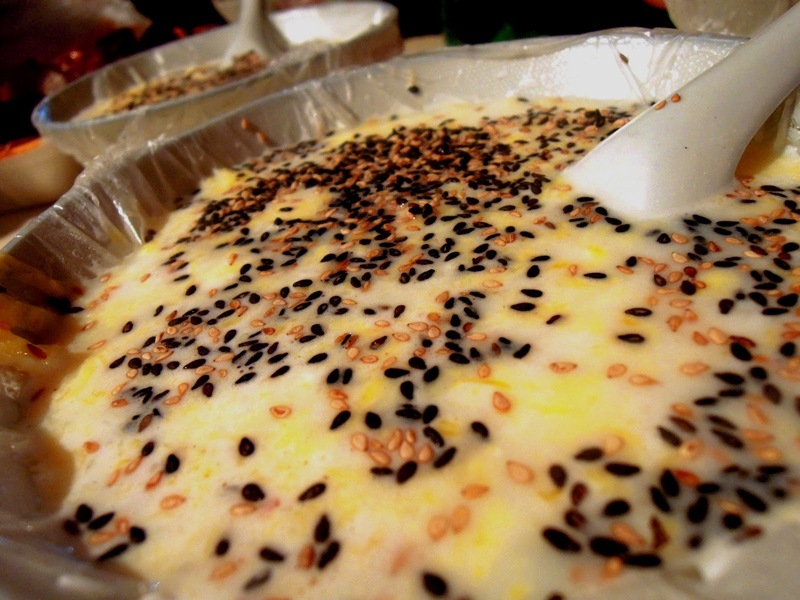 The ingredient list includes milk, eggs, fermented rice (basically like rice wine), black and brown sesame seeds, raisins, peanuts, and sugar. Individual vendors may alter the list here and there, but they should all include the milk, eggs, and rice. The ingredients are combined and cooked in an iron pot over an open flame. Consider it like a milky soup. It's fairly thin, though the rice (very, very soft), raisins, and peanuts are there to add some texture. The taste is sweet and dominated by the milk and egg flavors, with a hint of wine present to add some kick. I have previously documented my adoration for sweet foods, so it should come as no surprise to you that this was a highlight for me in Lanzhou (a city with many contenders for the highlight reel). I am not entirely sure whether this is considered a dessert or a meal. Either way, it tastes great and offers some neat variety from the standard fare on Chinese streets. If you're in Lanzhou, don't pass this one by. It can be found in the night market for around 5 RMB. 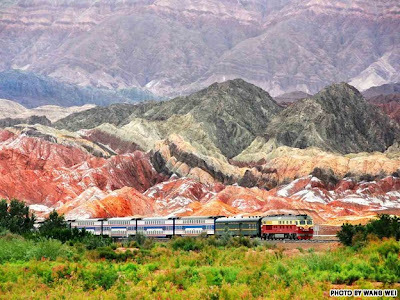 One of the great joys of traveling by train in China is the scenery. Especially when you get away from the East Coast, which sometimes feels like one big city extending from Hong Kong all the way up to Beijing. During the train ride from Kunming to Guizhou--one of my favorite rides in all of China--I remember a great moment when we came out of a long tunnel into a gorgeous green valley with terraced mountains flanking us on all sides. As the scenery exploded into view, there was an audible gasp throughout our train car. It was literally breathtaking. One of the great things about Mr. Wang's photography is that he treks out to the middle of nowhere and waits for the perfect shot. Many of these railways are overlooked by Western travelers (including me) because they are way off the beaten path. His photos remind me why these places are worth visiting (or just passing through). I'd encourage you to not only look at the CNNGo story, but also Wang Wei's personal blog. Lots more great photos there. His will be a great book when it comes out. In keeping with the noodle theme I've apparently been focusing on in my street food reviews lately, here's a dish notorious not so much for its taste but for its name. Specifically, the way the name is written. Biang Biang Mian is a traditional street food in Xi'an, and it uses one of the most ridiculously complex characters in the entire Chinese language. So complex that they haven't created a unicode version of it for computers--I have to use a picture. Be glad you don't have to sign your checks with that. Behold the character "biang!" It has 58 separate strokes, and requires most people to use mnemonic devices to remember how to write it (if they ever bother to write it at all). This is almost certainly the most complex character you will see in modern China. Several more complex characters exist, but they are archaic and virtually never seen. Biang, on the other hand, graces the signs on Xi'an store fronts selling Biang Biang Mian. Nobody is really sure what the origin of this word is, but there are lots of fun folk etymologies floating around out there. All right, enough about the name, the real question is how does it taste? For a food with such a ridiculously complicated name, it's actually very simple ingredient-wise. The noodles are long and very wide (some people liken them to belts). They are served swimming in a chili-red oily soup with some mutton and chives. Like many spicy foods in China, the chili here is considered to keep you warm in the winter and cool in the summer (due to the sweat). On a scale of 1 - 10, I would say the spice is no greater than a 6 or so, so if you don't get along with spicy foods, this might work for you. The verdict? Simple, tasty, and filling. Great for lunch or dinner on a cold winter's day in Xi'an. One well-known hometown dish that has escaped the confines of its native city is the Lanzhou Beef Noodles (兰州牛肉拉面) (Lanzhou Niu Rou La Mian). "La Mian" means "pulled wheat noodles"; the operative word there is "la." The method used to create these pulled noodles is both unique and lots of fun to watch. Starting with a block of dough, the noodleer (pardon me for the invented word) grabs the ends and swings it up and down to stretch out the dough to arms' length. He then brings the ends together, halving the length, and again grabs the ends and bounces. As the dough stretches out longer and longer, he keeps folding and bouncing until the original block of dough is one incredibly long thread of dough. The noodleer cuts off the folded ends, leaving himself with a handful of long, round noodles. Here's a neat New York Times video demonstrating the process. The best noodleers make this whole process look remarkably easy, tempting one to try it at home, though I have been told it actually takes years of practice to get it just right. The noodles are boiled and then served in spicy, oily soup with chili and beef. Though Lanzhou is way out west in Gansu Province, you can find this special dish in small shops in virtually all Chinese cities. Almost any Chinese person you talk to will be familiar with these spicy noodles.They are truly one of the most famous dishes in China. Which is why it came as quite a surprise to me when I learned that Kaifeng, an ancient city in Henan Province, offered their own take on pulled noodles: Kaifeng La Mian. The noodles are pulled out in just the same way in Kaifeng as they are in Lanzhou. The difference lies in the way it is served. Where the Lanzhou noodles are known for their spicy chili flavor, Kaifeng La Mian are delightfully sour. They come with a generous pile of cubed winter melon on top, and a bit of mutton for flavor. The noodles are served in soup, but they aren't swimming in it like their Lanzhou brethren. The sour chunks of melon--kind of a rarity in Chinese street food--are really a welcome experience for the taste buds. Kaifeng is renowned for incorporating a wider variety of flavors into their street food than many other Chinese city. I enjoyed my noodles immensely and came away wondering how it was that the Lanzhou La Mian had spread so thoroughly across China, but the Kaifeng La Mian--equally delicious and very different--had barely made it past the city borders. In a way it's kind of a shame (to be honest, I liked the Kaifeng noodles better), but on the other hand, it can serve as a nice reward to the people that make their way off the beaten path and into Kaifeng. It's a small but lovely city that is well worth a visit. Especially for street food lovers. Kaifeng La Mian shouldn't cost more than 5 or 10 RMB and are easiest to find in the fantastic night market in Kaifeng. Just look for the guys swinging noodles around like jump ropes. I recently added a new item to my admittedly very short list of things to do or see the next time I'm in Pittsburgh (most of the rest of the list can be found here. That addition? 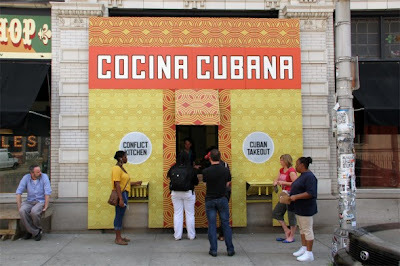 Visit the Conflict Kitchen. The idea behind the restaurant is simply amazing and amazingly simple: serve food from countries that the United States is in conflict with to help build bridges of understanding. Every six months, the owners select a new country that is on less-than-friendly terms with the United States and develops a menu from that country. Past national cuisines include Iranian, Venezuelan, Cuban (pictured above), and Afghan. North Korean cuisine is in the development stages. I think this is a brilliant idea, but my favorite part is that most of the menu is based on traditional street food. Regular readers of my blog know that I believe street food to be a great way of sharing one's culture and learning about another one. Learning what locals put into their stomachs can be a gateway to learning what they put in their hearts and minds. There is no food more local than street food. In addition to the menu options, Conflict Kitchen also arranges speakers, Skype conversations with locals in the countries they are focused on, and performances. I'm a believer in citizen diplomacy--the idea that a normal citizen is the best ambassador that a country can offer--and its corollary, street food diplomacy. Dialogue is the key to lasting international peace, and I'm glad to have learned about the steps the Conflict Kitchen is taking to promote that sort of dialogue about difficult issues. For further reading, you might look at this recent article from the Los Angeles Times. If any readers of this blog have been to Conflict Kitchen, please feel free to comment below--I'd love to hear your impressions! In the meantime, I'll look forward to trying it myself soon. Trains usually offer five different types of tickets (standing room only, hard seat, soft seat, hard sleeper, and soft sleeper). This variety is nice. Planes might have first class and economy, but no beds. Buses come in two varieties--seats and beds--but you're basically stuck with whichever is available on the route you want to take. Trains are far cheaper than airplanes (most of the time anyway--ask around because sometimes they have insane sales on inter-city plane trips). Trains also tend to be cheaper than buses, assuming you get the hard seat tickets. Trains have bathrooms on board. Buses stop every couple hours, but in between those stops you are on your own. You can get up and stretch your legs on a train. If your trip is more than a couple of hours, this is a nice luxury. For these reasons (and more), train is my preferred method of travel in China. This is not to say there aren't times where it makes sense to take a bus or a plane, usually due to constraints of time or the absence of a train station in your desired destination. So now that I've convinced you that you should be travelling by train, you might be asking yourself how one knows which train to take. 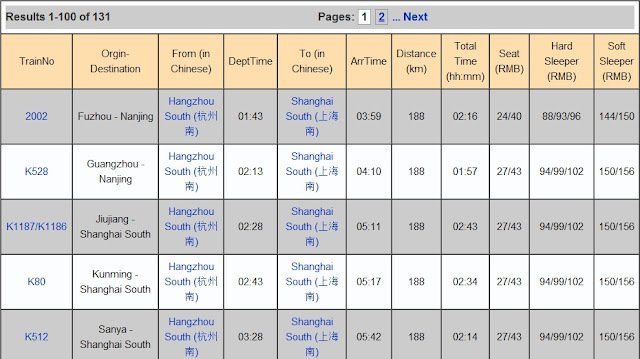 Back in January I did a lot of searching around for English timetables with limited success, until I discovered China Travel Guide's wiki-powered train searching function. Friend, this was a lifesaver. If you enter your desired travel route into the search boxes, it will come up with the trains servicing that route, including departure times, arrival times, and cost of tickets. Let's say, for example, that you want to go from Hangzhou to Shanghai. Your search results will give you 131 different potential trains to take. Notice a couple of things here. First, it shows you the price of hard seats and soft seats, top, middle, and bottom bunks on hard sleepers (the top bunks are always cheapest because they are considered less desirable), and top and bottom soft sleepers. This is very useful for trip planning purposes. Second, note that the train numbers and station names are active links. A click on the train number will tell you where else that train stops along the way. 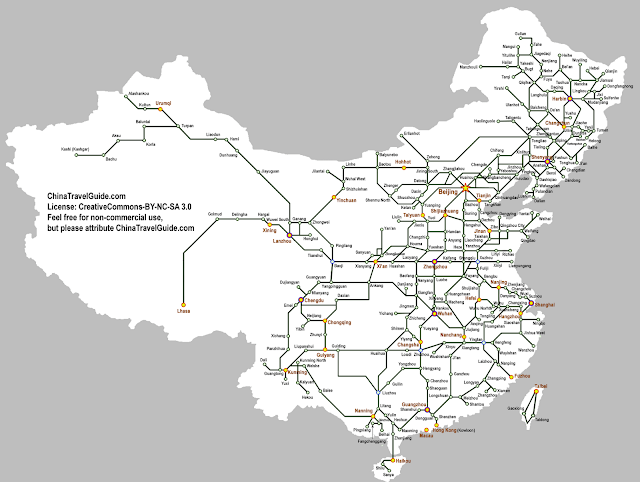 Click on the station name to see all of the trains that stop at that station (661 apparently come through Shanghai South every single day!). One other nice feature of the site is this handy railway map of China. It's not 100% complete, but it does show most of the big cities and how they are connected by the major rail lines. You can see why this website very quickly became one of my most utilized resources in China. Recall that I was travelling basically every other day to more than 50 cities, so a website that let me research train travel with this amount of detail was invaluable. I would routinely decide my plan for three or four cities in advance, and it was a huge help to be able to decide which trains I wanted before I arrived at the station to buy them. Some of you may be asking about how trustworthy this site is. In my experience, the accuracy is pretty close to dead-on. Here and there a train would be 5 or 10 RMB more than I expected, so be prepared for that. Only twice did I ever have noticeably faulty information from the site. First, the prices to and from Haikou were a good deal more expensive than this site said they would be. I think this is probably because the prices are calculated with an equation that uses the distance traveled and the type of train (fast, slow, old, etc.). The trip to Haikou includes a short ferry ride across the South China Sea, and my unverified suspicion is that they charge a bit extra because of the ferry portion of the trip and that wasn't accounted for by the normal equation. The other time this website failed me was when I was trying to go from Erlian to Datong. The search function shows a single train, K2. What it doesn't show (and what I didn't find out until I was already freezing cold in Inner Mongolia) is that the K2 train is an international train from Ulaanbaatar that only runs once a week or so, and I didn't happen to be there that day. Those were the only two times the site didn't give me accurate information, which is a fairly good track record. In brief, I wholeheartedly, 100% encourage you to use the China Travel Guide to plan your train travel in China. It is an excellent resource. A long time ago, a man named Zhou owned a tea shop. Every day for many years an old man came to drink tea and soon became friends with Zhou. One day, the old man didn't come to the tea shop. Zhou went to the man's house and found him deathly ill. Wanting to do something for his ailing friend, Zhou went back to his tea house and whipped up a dish of rice noodles, bamboo shoots, garlic, fermented beans, chili, beef, and peppers. He ran back to the old man's house and fed him the noodle dish. Miraculously, the noodles cured the man of his illness and he lived or many more years. Zhou's dish became legendary in Nanning for its healing properties and is now a staple throughout the city. The rice noodles are long and slippery, like fettuccine. The noodles are soft when the dish is served, and they slither right down your throat with ease. As you can see here, they do tend to clump together, so you'll have to do some good old fashioned Chinese noodle slurping. The soup base is oily and moderately spicy. To my mind, the bamboo is the most distinctive feature of this dish. The bamboo slices are a bit sour and add a firmer texture to the dish. It's worth noting that locals do believe that the old friend noodles have some salubrious properties, possibly attributable to the spicy chili opening up your pores (although there are much spicier dishes available nearby if you're trying that theory out). This dish shouldn't cost you more than about 10 yuan. It's available all over the city, but the best is in the fantastic night market on Zhongshan Lu. The bottom line? If you are looking for a warm, hearty meal with a neat history, this will fill the bill (and you). Question 1: How was your trip? Answer 1: Good, thanks! Also exhausting. But mostly good. Question 2: How far did you travel / how much did you spend / how many cities did you visit/ etc.? Answer 2: I would encourage you to check out this post I did that runs through some of the basic numbers of the trip. Question 3: Did you ever get sick? Answer 3: Nope! I'm proud to say that I didn't once get sick, despite eating almost nothing but street food for three straight months. Question 4: Did you eat dog? Answer 4: Yes, on three separate occasions. Once on noodles, once in a soup, and once in a sandwich. For the curious, there's a pretty grisly pile of dog bones in the picture at this link (don't click if you are sensitive to the idea of dogs as food). Question 5: What was the weirdest thing that you ate? Question 6: When will your book be finished? Answer 6: It's hard to say. I've never written a book before, and I have a couple of time-consuming commitments coming up later this year. Also, the trip was so grueling that I'm being gentle on myself now and not giving myself a firm deadline. I'm aiming roughly for the end of this year--I'll keep you updated as things progress. Question 7: What is the book going to be like? Answer 7: It will be a travel guide. No narrative or anything like that. I am planning for it to be structured like a traditional traditional travel guide, divided up by province and city, but instead of using it to find the local tourist attractions and hotels and whatnot, it will be used to find which street foods are local to each city. Question 8: What was your favorite food that you tried? Answer 8: That's a difficult question, and my answer changes all the time. There were so many great foods all around the country, I'm not sure I could narrow it to just one. If pressed, however, I might go with this one. I have a major sweet tooth, and this one really hit the spot. Question 9: What is the best city in China for street food? Answer 9: Another difficult question to answer. I don't think I could limit it to one city, so here are a few of my favorite spots: Lanzhou, Kaifeng, Chengdu, Chongqing, and Guiyang. Question 10: Wait, this isn't Google...I was trying to get to Google. Answer 10: That's not really a question, but here--try this. When I was in college, a good friend and I had a penchant for finding free food by any means necessary, even if it involved a few white lies. One evening as we attended the reception of a choral concert (without having attended the concert itself), my friend tried an unusual looking hors d'oeuvre. I waited expectantly to hear his impression. What I got was this: "It doesn't taste like fish, but I'm expecting it to at any moment." This line has become a go-to quote for me when discussing foods that don't taste the way they look. Wa Yu Er (蛙鱼儿) (literally "frog fish son," though some online translations tell me "salmon son") is one of these foods. A specialty in Xuzhou, the largest city in northern Jiangsu Province, wa yu er looks like this. By the looks of it, I was expecting it to taste a bit sweet, but mostly kind of bland. Like bits of potato starch suspended in a fruit syrup that is primarily just water. Thankfully, I was mistaken. The mix of flavors in this one cup was stunning. Every bite delivered a swirling mix of sweet, spicy, vinegary, and sour. As expected, the gelatinous potato starch globules were slippery and jelly-like. They provide texture and body to the wa yu er, but the taste is all in the syrup. Individual house recipes vary (apparently it also varies between winter and summer--it can be served hot or cold). Mine contained pickled vegetables, some vinegar, a healthy dose of chili sauce, and an unidentifiable sweet ingredient. Other recipes include soy sauce, sesame oil, garlic, dill, mustard, and more. Apparently the gelatinized potato starch can also be replaced with mung bean or pea starch. So the big question: do I recommend it to other street food connoisseurs? Reader, it was outstanding. Consider it recommended most highly. I could eat this stuff all day long. My host in Xuzhou was a transplant to Xuzhou from the southern part of Jiangsu and was not a fan of wa yu er, so it's not for everybody. As she pointed out, though, it is hugely popular with the locals. Everybody we asked could point us directly to their favorite purveyor of this local treat. One other point: attentive readers will recall a) that this dish is called "frog fish son," and b) that the ingredients I cited included neither frog nor fish (nor son, for that matter). So why has it earned this name? Easy. Supposedly these little globules look like small fish or tadpoles. This delightful concoction is available all over Xuzhou and should cost no more than 5 or 6 RMB. It may not look like much, but just like the food that didn't taste like fish though my friend expected it to at any minute, looks can be deceiving. Give this one a whirl--I don't think you'll be disappointed. Every traveler to a foreign country has to deal with the issue of money. If you're planning to spend longer than a day or two away from home, your costs are likely to be greater than the amount of cash you feel comfortable traveling with. Travel experts have suggested various solutions over the years, none of which are perfect solutions for all travelers in all situations. When preparing for my trip to China, I spent more time than I care to admit researching the options. I ended up deciding that for a three-month trip through a wide variety of cities, my best bet was to rely on ATMs to provide a steady stream of Chinese RMB. Of course that led to the next question: which bank should I put my money into if I want to pull it out in China. More research? More research. I looked on bank websites, read reviews, called customer service representatives, and did all the other due diligence things necessary until I found what I believe is far and away the best bank account for U.S. travelers abroad: a Charles Schwab High Yield Checking Account. 1. There are no maintenance fees on a checking account. True, most banks offer this, but not all. It's a good place to start. 2. With your Charles Schwab bank card, you are entitled to pull money out of any ATM in the whole world, so long as it has a VISA logo on it. This is good--those suckers are everywhere. 3. Here's where they start to distinguish themselves. Unlike some big banks, Charles Schwab doesn't charge you any fee to pull money out of a different bank's ATM. 4. Continuing with this "no-fee" thing, Charles Schwab doesn't charge you a conversion fee. Many banks charge a percentage of the withdrawal amount as a conversion fee if you are collecting a different currency than the currency in your home country. I'm not a banker, but it seems to me that conversion fees are pretty silly. Does it cost a bank anything to calculate the conversion rate? If I can check on Google for free, I don't get the sense that a company that lives and dies by exchange rates would have any trouble with it. So why charge me anything to do it? Charles Schwab succumbs to logic and charges no conversion fee. 5. This is the real kicker. In addition to the above no-fee tactics, Charles Schwab goes one step further and offers to reimburse you if the ATM you are using charges you a fee. Think about that for a moment. How many times have you been traveling--abroad or at home--and had an ATM say that it's going to charge you $3.00 because the bank name on the ATM doesn't match the bank name on your card? With Charles Schwab, the ATM can charge all it likes--Charles Schwab will literally pay you the money back. This is fantastic. So it sounds good in theory, yes? How does it work in practice you say? Exactly how they said it would. I used this card at ATMs all over China (really...all over) with no hassle at all. Charles Schwab never once charged me a fee, and when the foreign banks charged me a on-site fee to use the ATM, I was reimbursed completely. I can't tell you how convenient it is to have access to your money in any city in China. I never had to carry more than 1000 yuan (about $160) on me at any given time, and I was able to pay for everything in cash. Are there any downsides to the Charles Schwab solution, I hear you asking? Of course, I respond; but they are few and negligible. For one, Charles Schwab does not maintain very many physical offices. In order to deposit money, you need to either transfer electronically from another account or you need to mail them a check to deposit (in postage-paid envelopes that they will provide you). The electronic transfer process is easy, but it does take a few days for the money to become available to you--best not to wait until the day before your trip to do this. The only other very minor drawback to this solution that I can think of is that you are required to open a Charles Schwab investment account to be able to hold a checking account. That sounds a bit scary until you learn that you don't have to keep a minimum balance in it. You can open the account and then leave it completely empty for no charge. It's a bit of an inconvenience, but certainly no reason to overlook all of the great qualities of the checking account. This card worked perfectly for me. I have no reason to doubt that it won't work for you as well. It truly seems like the ideal solution for a traveler going abroad. So long as you aren't spending all of your time in completely rural areas that don't have ATMs, this could very easily be the best solution for you. Thus concludes the first official product endorsement of this website. Charles Schwab High Yield Checking Account: I salute you. That may look like an ordinary hard-boiled egg, and in many ways it is. There is just one key exception: this egg is cooked in the urine of young boys. Preferably under the age of ten (because urine from an eleven-year-old would just be gross). This delicacy is known by various names, the most descriptive of which is 童子尿煮鸡蛋 (tong zi sui zhu ji dan), or "boy urine cooked egg." This is often abbreviated to just 童子蛋 (tong zi dan), or "boy egg." Some of you may have already heard about these boy eggs because Reuters recently did a story about them that made the rounds on the Internet back in March and April. One thing that was missing from the Reuters story, though, was a personal taste test. That, of course, is where I come in. Boy eggs are not easy to find in China. They are really only available in one city (Dongyang (东阳), in Zhejiang Province) and only in the springtime. I heard rumors from some seatmates on the train that boy eggs were also available in other southern Chinese cities, but I haven't found anything to substantiate this. Frankly, in my experience they weren't even easy to find in Dongyang itself, even though it's been officially listed as part of the city's "intangible cultural heritage." It took a good bit of asking around before I found a woman selling them from a wide, rusty pot. I am nothing if not dedicated to my street food project, so I dutifully suppressed the part of my brain that was reminding me that these eggs had been cooked in urine and bought one for 1 yuan. After finding a suitable spot to sit and eat, I got down to business. On the outside, as you saw above, it looked just like a normal egg, albeit with a faint urine smell. Once shelled, however, it's a different story. That marbleized look you see is the result of the cooking method--after boiling in the urine long enough to become solid, the eggshells are cracked a bit to allow the urine to soak into the egg itself during the remainder of the boiling. Those lines on the egg are where the cracks were in the shell. Actually, this shelled egg doesn't look terribly different from the tea eggs you can find all over China. The key difference there, of course, is that the tea eggs are cooked in tea instead of the urine of young boys. I can't emphasize that point enough--that this is an egg cooked in urine. Now, while the look of the boy egg is fairly similar to the tea egg, there are several important sensory differences. The most notable are the way it smells and feels. Have you ever changed the bed sheets for a child who wet the bed at night? If so, you may recall the way that the air is heavy with the odor of stale urine and that your fingers feel a bit slimy after touching the soiled linens. Throw in the smell of egg for good measure, and that's exactly what it is like to hold a boy egg, which, I remind you, is intended for human consumption. This slimy, rubbery ovoid that smells like stale urine and egg is meant to be eaten. So, with the preliminary examination complete, it was time to eat the boy egg. Once again suppressing that part of my brain that was reminding me about the whole "cooked in urine" thing, I dove right in. The result? Surprisingly, it wasn't that bad. In fact, it didn't taste substantially different from other hard-boiled eggs I ate in China. That strong odor of urine didn't translate into a strong taste, oddly enough. That's not to say that it wasn't there--it was just very mild. Like most hard-boiled eggs in China, the white (if you could call it that) was salty (though perhaps the saltiness in the boy eggs came from a different source...) and rubbery(they tend to cook eggs longer in China than we do in the USA), while the yolk tasted like every other hard-boiled egg yolk I've ever eaten. The inside looked exactly like you'd imagine. Two or three bites and it's gone. So that's that. The foremost question in your minds, I suspect, is "why would anybody eat this?" The short answer is that it's tradition. Tradition is a powerful force in China, and in Dongyang these boy eggs traditional. The longer answer is that Chinese traditional medicine values the urine from virgin boys as a good preventative measure against joint pain and other ailments. Why it has to be boys and why they have to be virgins, I don't know. Many people in Dongyang eat these by the dozen in the springtime. That's not to say that everybody likes them, of course. Some Dongyangers find the whole idea repulsive. Also, it's worth noting that anytime I mentioned the boy eggs to a native Chinese person in any other part of China, they were pretty grossed out by the whole idea. So I caution you against thinking this is something everybody in China does. Just like eating dog or cat, it's true that some people do it, but it's not everywhere and it's considered gross by much of the population. Another question you might be asking is "where do they get the urine?" Easy answer: local schools. As you can see from this great 2011 article from the Ministry of Tofu, vendors provide buckets to schools and encourage the boys to use those rather than the toilets. I admit that after eating my boy egg, I couldn't help but look at every school-age boy I passed on the street and wonder whether or not he contributed to my lunch. I also suspect many of you may be questioning how sanitary this endeavor is. Not very, to be honest. However, most doctors in Dongyang agree that these eggs won't hurt you (even if they don't believe in the therapeutic benefits). Depending how much faith you put in Chinese doctors, you can probably feel reasonably comfortable on the safety front. So those are the boy eggs. I wouldn't label them a must-try street food in China. They are difficult to find (Dongyang isn't exactly on the tourist trail...there isn't even a train station) and aren't amazingly tasty or anything like that. They are however, extremely unique (remember: these are eggs cooked in urine), so if you're the type that likes to track down the most unusual foods you can, it might be time to plan a pilgrimage to Dongyang. For the rest of you, I suspect reading about it here was more than enough. I'm happy to oblige. I just want to take a moment here to acknowledge a generous endorsement from TYWKIWDBI, an eclectic blog that I check out nearly every day. Back in April, TYWKIWDBI's creator, Minnesotastan, encouraged readers to share their own blogs with him, which he then shared with the broader world in this post titled "The Best Blogs of 2012." Thanks, Minnesotastan, for this endorsement and all of your fine work on your blog! If you've never checked out TYWKIWDBI, I encourage you to do so now and check back regularly--it is always full of fascinating material. You may have noticed that I haven't posted too much since I returned from China three weeks ago. Please accept my apologies for this lapse. As it turns out, travelling nearly constantly for three months is exhausting. You may have seen in the Final Statistics post that I averaged less than 34 hours in each city. In each city I had to research, locate, and eat the most representative local street food, plan my itinerary for the next few stops, buy train tickets, find Couch Surfing hosts, and find time to sleep. All within those 34 hours before jumping on the train for my next city. Imagine doing that on repeat for three straight months through 53 cities without the regular restorative benefits of free weekends and evenings you would get from a standard 9 - 5 job and you will have a sense of what this was like. These are not complaints, of course. I chose this path for myself and have no regrets about my hectic schedule. That being said, it was more tiring than I expected. I had planned to give myself a week of rest before beginning to work in earnest on my book. It seems, though, my body and brain wanted a little bit more than that. With no firm deadline for book completion breathing down my neck, I decided to ease into things at whatever rate felt natural to my brain and body. So here we are three weeks later. I am feeling rested and able once again to focus on Chinese street food. I expect there will be more regular posts these coming weeks. Thanks to all for bearing with me during this resting period. I'm looking forward to getting back into the swing of things. If you're among the 4/5 of the world's population for whom Chinese is not your native language (and, frankly, if you reading this, I think it's safe to assume that you are), then independent travel in China might seem like a daunting prospect. To you I say, "take heart!" Though it is admittedly easier to travel in China if you know at least a handful of Chinese words, it is possible to get by without any Chinese language skills. When it comes to communication, a series of gestures and pointing can usually get you the basic necessities. As for reading, you won't often find yourself in a position where you have to read important information in Chinese. Most of the time the inscrutable Chinese characters you see are not vital to your well-being, and if they are there is usually an English translation. One exception to this rule is train tickets. Your life will be much easier if you can decipher the information on your ticket. That being the case, I thought it might be useful to provide this short guide to the parts of a Chinese train ticket. Here's a picture of a ticket with different parts numbered for explanation below. This is the origin city for your train ride. Tickets always include the Chinese characters and the pinyin. This is the destination city. Again, you will always have the city name in Chinese and pinyin. A tip: if you have a guidebook or something else that lists the Chinese characters of your destination city, it's worth double-checking your ticket after you buy it to be sure you are going to the right city. Some city names sound very similar, or even have the same pinyin, and it's better to find out you have the wrong ticket before you leave rather than finding out upon arrival. One other note: big cities often have several train stations servicing them. The different stations are typically distinguished from one another with one of the cardinal directions. In Chinese, these words are Bei (北) (North), Nan (南) (South), Xi (西) (West), and Dong (东) (East). 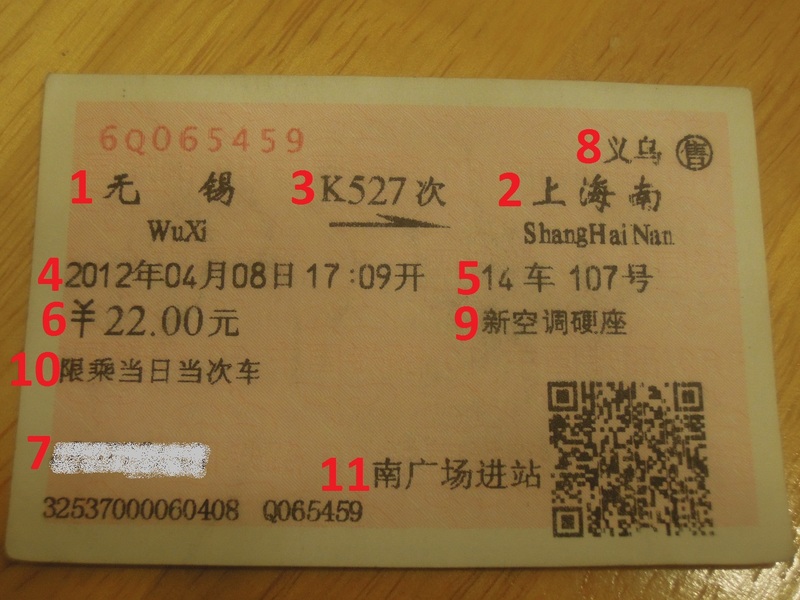 On the sample ticket above, you can see that my destination was Shanghai Nan, or Shanghai South Station. This is a good thing to be aware of when you are buying and reading your ticket. This is your train number. This is the date and time of your departure. The sample ticket says: 2012年04月08日 17:09开. You're a smart person and can figure this out on your own, I'm sure, but 年 means "year," 月 means "month," 日 means "day," and 开 means "start." My train above left on April 8, 2012, at 5:09 p.m. (actually, it ended up leaving about twenty minutes behind schedule, but that's beside the point). All tickets use the year-month-date format, and use a 24-hour clock for departure times. This is your carriage and seat number. My ticket above says: 14车 107号. 车 means "car" and 号 means "number." So, in this case, I needed to find seat number 107 in carriage number 14. Easy enough, yes? If you have a ticket for a bed on the train, this section of the ticket will also tell you which bunk you are assigned to. It will either say 上 (upper), 中 (middle), or 下 (lower). In that situation, the 号 number will indicate which column of beds your bunk is in. This is the price you paid for your ticket. If you booked through a ticket agency or a ticket office outside of the station, you will have paid a service fee on top of this price. This is your name and/or passport number. This tells you where you bought the ticket. In the example above, I bought the ticket at the Yiwu (义乌) train station. This gives you information about the carriage you'll be in. The ticket above roughly says that my car is a hard-seat car with air conditioning. This tells you what days it's okay to use your ticket. The above ticket (and, to be honest, every ticket I ever got in China) says that it can only be used on the date shown on the ticket. Apparently you can sometimes buy tickets that can be used any time within a certain window, but I never came across that as an option so I can't say much about it. Most tickets don't have this, but if they do it's worth paying attention to because it's important. This tells you which entrance you should enter the station by. In the example above, it says I should enter from the South Square. Most stations either only have one entrance or have multiple entrances that all get you to the same place. Here and there, though, a station has multiple entrances that lead you to different places, so it's important to enter from the correct entrance. And that's about it. So long as you know what your ticket says, you should have no trouble navigating China's excellent train system. Happy traveling, friends. I've run the numbers and come up with the following statistics about my journey. Whether or not you're the type of person who thinks in numbers, I hope this will put the trip into perspective a bit. This is about half of my train tickets. The last picture before I got it shaved off for 10 RMB. So there you have it. My China trip by the numbers. *This is only a rough estimate, as the population of Chinese cities is notoriously difficult to calculate. This information came primarily from Wikipedia, with other sources used when necessary. Though it is difficult for me to believe, the facts are undeniable: my trip through China is finished. On Wednesday, April 11, I returned home to my wife in Washington, DC. How was the trip? In short, it was amazing. It was also exhausting, but let's focus on amazing for now. You may recall that my goal was to hit 50 - 60 cities in my three months in China, and that I had planned to visit all 33 provinces (using the term "province" loosely to encompass all of the provincial level administrative divisions in China). I managed to achieve the first goal, with a grand total of 53 cities. The second goal proved more difficult, as the Chinese government forbade all foreigners from entering Tibet in February and March, which was exactly the time of year that I was in that part of the country. So no Tibet. I did, however, visit all of the other 32 provinces, so we can basically call the trip a success on that front as well. Click on the picture for the Google Map. I saw a huge variety of landscapes (mountains, deserts, forests...you name it), met lots of interesting people, and ate hundreds of different foods. I've compiled some statistics about the trip, which I'll post a bit later. For now, I will limit myself to offering my great thanks to you, dear readers, for following my journey here at www.chinesestreetfood.com. You should know that although my trip is complete, there is a lot of content yet to come on the website. As I compile my book, I will continue posting street food reviews, funny things from China, book progress updates, and whatever else seems appropriate. I hope you will continue to check in from time to time. My trip through China was a phenomenal whirlwind of an experience. Now I look forward to continuing the project here at home. As one look at that map could tell you, it is going to be a real treat to stay in one place for a while. Here's another street food to file under the "guilty pleasures" category. Huang You Chao Mi (黄油炒米) originated in Mongolia, so you're most likely to find it in the parts of China that have a big Mongolian influence (namely, Inner Mongolia). There are really only three main ingredients, listed here in order of prominence: butter, crispy millet pellets, and sugar. Attentive readers will have already noted that the first--and therefore most prominent--ingredient is butter. This simple fact is the reason that huang you chao mi is such a guilty pleasure. You are essentially eating a bowl of butter, with some millet for texture and sugar for taste. If it sounds delicious, that's because it is. The butter is sweet and creamy, which the millet contrasts with a satisfying crunch. It is served chilled, so the butter is firm enough to retain its shape while you dig in. All in all, this is a rich, decadent treat. Though I personally ate it in below-freezing temperatures, I suspect eating this dish would be a wonderful way to pass a lazy, hazy summer afteroon. At the risk of broaching a subject that is unsuitable for polite conversation/blogging, I would like to take a moment to talk about going to the bathroom in China. While first-time travelers to China often have no trouble with the eating of Chinese food, they can be confounded, stymied, or otherwise caught off guard by some of the practicalities of tending to the other end of the digestive tract. It is for those travelers that I present this straightforward guide to the ins-and-outs, so to speak, of using the restroom in China. 1. Most travelers have been (accurately) forewarned that Chinese toilets are traditionally squat toilets, rather than the Western-style toilets that you actually sit on. This is not to say that you will never see a Western-style toilet in China, of course. You should just be aware that these seated commodes are more commonly found in private homes than in public restrooms. My general rule is to always expect a squat toilet wherever I am. If you are always hoping for a chance to sit down, you will be frequently disappointed. If you've never used a squat toilet, the procedure is pretty self-explanatory so I won't describe it in detail. The only tip I might suggest is to try to keep your feet completely flat on the ground. Most Westerners squat on the balls of their feet, with their center of gravity pushed forward a bit. If you look around China (and other Asian countries), you'll see that most people here keep their heels flat on the ground, which allows them to shift their weight a little farther back, right over their feet. This might feel awkward at first, but it is much more comfortable for long-term squatting (whether using the restroom or just resting). For what it's worth, studies have shown that squatting is a much more efficient way of vacating one's bowels than sitting down in the Cassiopeia position. If you are sitting, your colon is sort of pinched like a garden hose with a kink in it, which means more effort on your part to get the job done. Squatting positions the colon straight up and down, which means most of the work is done by gravity. Benefits include shorter times in the restroom and fewer instances of hemorrhoids. Just something to keep in mind. 2. Some would call this the first commandment of independent travel in China: ALWAYS CARRY TOILET PAPER. It is very, very rare for a public restroom to have toilet paper for you to use. Most people in China carry small packs of tissues with them wherever they go. When nature calls, you don't want to put the call on hold while you go in search of tissues. You can find these packets of tissues at almost any convenience store or small market in China. A pack should never cost more than 2 yuan. 3. While we're on the subject, you generally want to avoid flushing toilet paper down the toilet in China. The pipes can't always handle the paper, which causes clogging and unpleasantness for all. If you see a trash can next to a toilet, you can assume that you should throw your used toilet paper into there. One exception to this rule is on trains. Most train toilets exit right out onto the tracks (yes, it's gross), so there aren't really any pipes to get clogged. The train tracks are screaming by right underneath that hole. 4. If you're out on the town and need to use the restroom, you have a few options. International fast food chains (especially the ubiquitous KFC and McDonald's) have reliably cleanish bathrooms that you can use without buying anything. The restaurants might frown on this, but they never stop you. If you don't feel like freeloading, you can usually count on finding a public restroom out on the street somewhere. You have a better chance at finding one of these if you are in a downtown area, though they exist in every part of the city. They are generally advertised with street signs that use internationally recognized bathroom icons to point you in the right direction. Most of these restrooms are free to use. If there is a fee, it's negligible--usually no more than 0.5 yuan (about $0.08). Don't expect much from the public restrooms in China. They are there to get the job done, and that's about it. Most (not all) are smelly, dirty affairs. Some have no doors on the stalls. Once in a while you come across one that is just one long trough with short (1.5 meter) walls to offer the tiniest bit of privacy. In general, though, they are entirely functional and usually offer enough privacy for the Western sensibilities. They aren't palaces, but they'll do in a pinch. That's about all I have to offer. If anybody else has further tips on using the restrooms in China, feel free to say so in the comments. 6. I wrote above that public Chinese bathrooms rarely provide toilet paper for your convenience. It's worth noting that the same applies to soap. There is almost always a sink with running water, but very rarely is there any soap to use. If you're the type that likes to wash your hands with something more than water after using the restroom, you'll probably want to have your own supply on hand. This is a public restroom in Fuzhou. I want to draw your attention to the scrolling LED displays above the door, which tell you if the stall is occupied or not (you can see the word "Occupied" starting to scroll across on the right stall). What caught my attention was that if a bathroom was, in fact, occupied, the display also listed a running count of how long it had been occupied. See the display over the left stall for an example of this (six minutes and counting!). I'm not sure if this is a ploy to shame folks into not taking too long or if it's meant to be a helpful tool for those trying to decide which door to line up in front of. If they had the former goal in mind, it seems to me that the process could be improved by having a video display in the stall that shows this video after, say, five minutes. 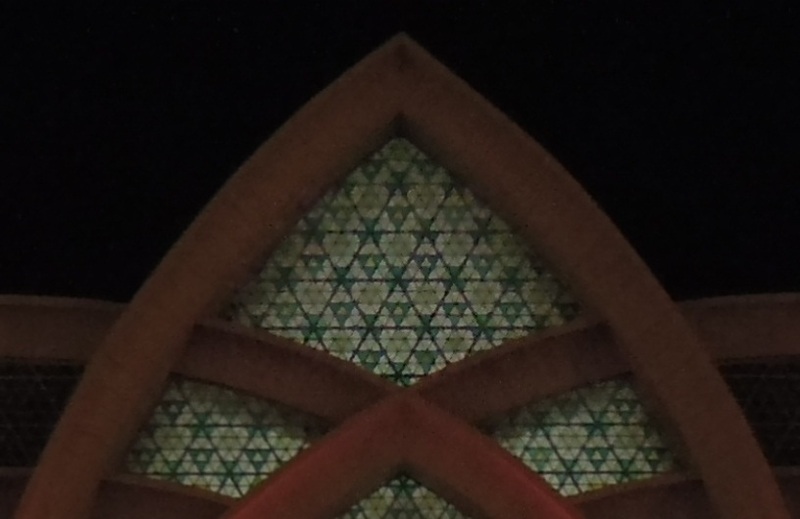 This stained glass is also on the sides of the building, which you can see from the inside of the station. So we've established that the new station is much more attractive than the old station, and it incorporates some traditional Muslim architecture and decoration. Is that alone enough to make it my favorite of all of the Chinese train stations? No--there's more. Remember when I said that Yinchuan is infrequently visited by Western tourists? If I had to take a totally out-of-thin-air guess, I would say that this station handles fewer than 500 Westerners per year. In comparison to the hundreds of thousands of Chinese folks that pass through (again, just a ballpark estimate), Westerners are a rare breed 'round these parts. And yet every single sign in the station had an English translation underneath the Chinese. This is not too common in some of the smaller cities in China, even provincial capitals. But Yinchuan didn't stop there. They took it one step further and added good English translations to all of the spoken announcements that came over the station's loudspeakers. This is really rare in China. Even some of the big coastal cities don't offer this courtesy to English speakers. Now, of course I realize that I'm in China, a country where they speak (believe it or not) Chinese, so I make it a rule to never expect English anywhere. That would be mighty arrogant. That being said, if a restaurant, hotel, or train station does offer English translation (especially when it's not a ploy to drum up some extra tourist money), it really makes you feel welcome. It shows that they've gone out of their way to cater to a very small portion of their clients. They don't have to--they just do. So there you have it. Congratulations, Yinchuan Train Station. You're my new favorite station in China.